Just for the heck of it, I listed my tickets to Tuesday's Nationals game on StubHub at a 300% markup. Stephen Strasburg is scheduled to pitch, and our season ticket seats are right by the Nationals bullpen. To my surprise, the tickets sold within a few hours. I once had a professor say that you can benefit if you enjoy things that few other people do. For us, our quirk is that we enjoy the games in which Stephen Strasburg doesn't pitch. We like it when the games are less crowded, which means shorter lines and less of a crunch heading to the Metro after the game. Plus, we've already seen him a few times. We'll happily sell our tickets to the Strasburg games, because other people value them so much more than we do. I won't quite be able to go to other games for free because of the Strasburg proceeds, but selling those games will sure put a dent into my season ticket bill. There are teams that sell out every game, and there are teams that nearly can't give away seats. But the Nats have a strange situation on their hands, in that Strasburg gives them an attendance jolt every 5 days. In fact, I think the day after his debut represented the largest drop-off in ticket sales between games in major league history. Note how people like me can take advantage of this phenomenon, but the Nationals can't. They can't triple their prices every five days, or invalidate cheap ticket sales that occurred months ago. I hope I'm not costing myself hundreds of dollars by writing about this, but such is the price of ego. Let's just hope the kid doesn't get hurt! Why Are Baseball Seats Filled So Unevenly? CC photo courtesy of ttarasiuk on Flickr. I often see scenes similar to the above photo at Nationals Park. Notice the lower sections of seats, closest to the field. The ones to the left and center are nearly full, followed by two sections that are nearly empty, followed by sections to the right that are nearly full. This is puzzling at first, but it makes perfect sense once you consult the seating and pricing guide. The seats in the far right of the photo are the pink seats in the guide. They are $10 cheaper than the seats next to them in the mostly empty sections, which are at the cutoff of the higher pricing zone. The tradeoffs of seat pricing zones are intriguing. One extreme is general admission, where everyone pays the same price. 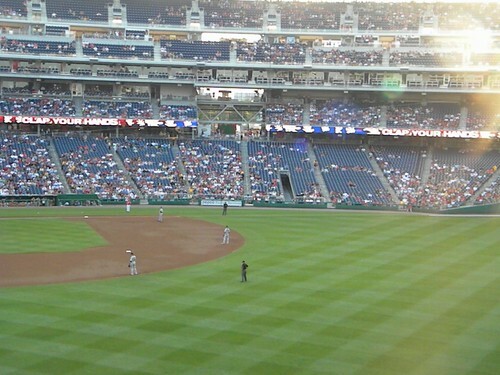 On the other extreme, Nationals Park and other sports stadiums probably have the highest number of pricing zones of any event where tickets are sold, yet there are still numerous instances where seats that are mere feet from each other cost substantially different prices. The advantage of pricing zones is obvious: a seat right behind home plate shouldn't be the same price as a seat in the nosebleeds. So why aren't there hundreds of price zones, instead of dozens? Transactions costs would be way too high. Or, in non-economist speak: it would be too much of a hassle. What Determines the Length of Labor Strikes? I have a recent paper in the Journal of Labor Research, which attempts to model the various factors that influence the length of labor disputes. What if the Best Teams Drafted First? I am in the midst of reading the thoroughly depressing "The Elusive Quest for Growth " by William Easterly, which details how various attempts to help developing countries escape poverty have failed because of misaligned incentives. For example, giving the most foreign aid to the poorest countries gives Third World leaders incentives to keep their subjects in poverty and therefore acquire even more aid. Alternatively, giving aid conditional on political or economic reforms doesn't work; when poor governments become increasingly corrupt, donors don't have the heart to stop giving aid. And on and on. That got me to thinking: Do we try to improve the worst sports teams in the same incentive-perverting way that we're trying to help the poorest countries? Professional sports leagues award draft picks in the reverse order of the teams' standings the previous year (there are some technicalities, such as the NBA's draft lottery and baseball's draft pick compensation for lost free agents, but the point remains the same). The idea is that the worst teams get first choice at the top rookies, thus enabling them to become competitive in the near future. If the reverse-order draft did nothing to change teams' behavior, it would be an admirable policy. But statistical research has suggested that teams might be losing on purpose to improve their draft standings. For instance, each year the worst baseball teams trade away many of their best players in July and give ample big-league playing time to unpolished young prospects who otherwise would be kept in the minors. I wonder if the Washington Nationals wish they had won a few more games during their horrid 2008 campaign. Because they didn't, and therefore finished dead last, they were awarded the No. 1 pick the next year and thus the rights to rookie phenom Stephen Strasburg. And all the sellouts, merchandise sales, and national media exposure that came with him. I'm sure they're devastated. Grunfeld sat in the back room to watch the Ping-Pong balls bounce in favor of a franchise that finished 26-56 last season, enduring a trying campaign. Abe Pollin died of a rare brain disease in November; star point guard Gilbert Arenas was suspended for the final 50 games and received a felony gun conviction after bringing guns to the locker room in a dispute with teammate Javaris Crittenton; and Grunfeld detonated the roster with a flurry of trades at the deadline that shipped out former all-stars Antawn Jamison and Caron Butler, as well as Brendan Haywood and DeShawn Stevenson. Setting aside the death of team owner Pollin, none of the above is behavior that the NBA or its fans want to encourage. Yet the team was rewarded with the No. 1 pick. So while corrupt leaders end up with more foreign aid, incompetent team owners or upper management end up with top draft picks. How could these systems be improved? In his book, Easterly suggests that the most aid should go to countries that have implemented the most economic reforms, not the ones who promise to implement them, thus making their commitment to improve credible. In that spirit, why not give the highest draft picks to the best teams, rewarding them for winning? Or, for a less-extreme solution, why not make the draft order random? Either approach would remove the incentive to lose. Of course, bad teams would suffer. After the losses began to mount, maybe the teams' management would be replaced by more competent personnel. Maybe teams that can't draw many fans will improve their on-field product, move to more lucrative markets, or go bankrupt. Are these outcomes really that bad? In the NHL, each player's impact on the team's salary cap is based on the average annual value of his contract. Just as government officials and corporate executives often use creative accounting to meet certain fiscal goals, sports team aren't immune from trying to game the system. The contract was rejected because years of low salary at the end of the deal were added for the sole purpose of lowering the cap hit. The person added that it was determined that neither the Devils nor Kovalchuk believe he will play the final years of the deal at those terms. The All-Star was slated to earn only $550,000 in each of the last five seasons of the contract that was to run through the 2026-27 season, when Kovalchuk will be 44. Kovalchuk was to earn $98.5 million of the $102 million in the first 11 years of the deal. Which Commute Would You Prefer? (1) Suppose you have a morning commute that averages 30 minutes. However, the travel time has a high variance. Twenty percent of the time, it takes 15 minutes. Another 20 percent of the time, it takes 45 minutes. The rest of the time, your commute lasts somewhere in between. You have no way of knowing in advance. What is your optimal behavior? Do you allow 45 minutes, even though you'll be extremely early most of the time (about four days a week)? Do you allow 30 minutes and take your chances that you won't get fired on those days (about once a week) that you'll be 15 minutes late? Or do you do something else? (2) Suppose instead that your morning commute is usually 30 minutes, but each day there is an X% chance that it will be 45 minutes. Certainly, you should allow 30 minutes if X is sufficiently small (say, 0.02%); you shouldn't arrive 15 minutes early every day to avoid being late once every 20 years. For larger values of X, though, the risk of being late becomes too high, compelling you to allow 45 minutes. But what is the cutoff point? (3) Suppose instead that your morning commute is always 45 minutes, without fail. Each day, you are spending an average of 15 minutes longer commuting (30 minutes, if you count both morning and afternoon commutes) than under the first scenario, yet your schedule is predictable from one day to the next. Note that you could always allow 45 minutes under all three scenarios and never be late. In the first two scenarios, on those days you arrive early, you could spend some of this time at the coffee shop, or on a park bench, or getting an early start at the office. Your options are wider for that excess time, compared with the third scenario, yet you have a feeling that you're wasting a lot of time by arriving early so often. I bet many people, myself included, would prefer the third scenario, even though it means a longer expected commute and doesn't allow you the freedom to do other things on the days you are early. Remember a few months ago when I was wondering if it would be worthwhile for a "Price Is Right" contestant to memorize car prices? Well, as described by this Esquire article, one contestant did his research and got the showcase price exactly right, thus winning both showcases. Hat tip again to Neatorama. Can Per Capita Growth Be Bad? It can, if it's the result of more poor people dying. Again, if many poor people survive longer in an LDC [less developed country], this depresses per capita incomes and leads to what is habitually termed a worsening income distribution, both within the particular country and relative to richer countries. Conversely, if more of the poor die or a society reverts to subsistence production, this brings about more equal incomes within a country, accompanied by a rise in per capita incomes in the former case and a decline in the latter case. Dig Through the Trash. We'll Pay You. TRASH CHUTES: ... You are not permitted to leave your trash in front of your apartment door or on the floor in the trash room. If this is found, the trash will be inspected and a $25.00 charge will be fined to the resident for improper trash disposal. Trash rooms open at 6:00 am and close at 10:00 pm. I've encountered a locked trash room more than once. I stay up late, and I once had to throw the trash away early in the morning before a flight. Each time, I have left the trash bag outside the locked room and have yet to be fined. This is a great example of the principal-agent problem, or a conflict of interest between owners and front-line employees. The owners may want to fine residents who don't observe the policy, but think of the situation facing the concierge (or resident) who finds the rogue trash bag. Does he put on sanitary gloves, open and dig through the vile-smelling trash bag in search of a discarded envelope addressed to the offending resident, and file a report with the management against the resident, potentially drawing dirty looks from said resident whenever he passes by the concierge desk? Or does he simply place the trash down the chute and avoid all the drama? It's clear that ignoring the letter of the law is the easier course of action for the agent. Finally, I'm still mystified about why the trash rooms are locked in the first place. My only theory is that the management doesn't want homeless people to sleep in them overnight, but what are the chances that that would happen anyway? Nationals Win Me Over. Reluctantly. "I can't give you the satisfaction of saying you talked the crazy blogger guy into buying season tickets after all." Well, since that time, Sharon and I have attended several games this season. I finally caved and bought a flex plan, which involves getting tickets to three games in order to get a fourth free. I should have already done this several times over this season, as we go so often and the Nats have become Sharon's favorite team. I guess my love of baseball and desire to economize on ticket purchases, as well as Sharon's inexplicable fandom of relief pitcher Tyler Clippard, have won out over my pride. You win, Nationals ticketing office. My AT&T data use, by month. AT&T began to offer discounts for limited data plans, effective in the latest billing cycle. The Freakonomics blog recently wondered if AT&T's switch to offering limited data plans for a discount to iPhone users might actually increase some people's usage, as they no longer feel as guilty about "hogging the network" as they did when everyone had unlimited plans (more on the details here). I'm living proof. When the offer was announced, I noticed that my usage had always been well under the 2GB-a-month limit, which I could switch to and save a few bucks a month. 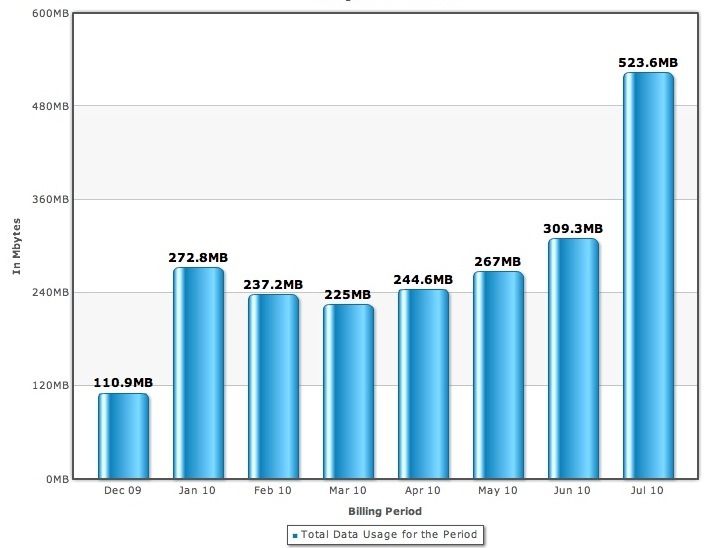 I happily made the switch, and my usage the last month was almost twice as high as my average usage in recent months. This is the same effect that occurred with the famous Israeli day care that began charging parents a fine if they picked up their children late. Suddenly, late pickups soared, as parents felt that they had morally balanced their books by paying the fine and thus were entitled to show up late. One of Mancur Olson's principal points in "The Rise and Decline of Nations " is about the dangers of special interest groups imposing costs on the rest of society in order to win a larger share of economic profits. HARRISBURG, Pa. (AP) -- Swipe your driver's license, look into the camera, blow into the breath sensor and - voila! - you have permission to buy a bottle of wine from a vending machine. Pennsylvania, which has some of the most Byzantine liquor laws in the nation, recently introduced the country's first wine "kiosks." If the machines are successful in their test run inside two grocery stores, the state Liquor Control Board could place the high-tech alcohol automats in about 100 others. The vending machines are a testament to both the wonder of technology and the obscurity of Pennsylvania's complicated liquor laws. Individuals can buy wine and liquor for home consumption only in state-owned stores staffed by public employees. Private beer distributors sell cases and kegs only. Licensed corner stores, delis, bars and restaurants can sell beer to go, but only up to two six-packs per customer. Yesterday, I wrote about the wonderful application of economic theory to a dilemma from Seinfeld. The paper I mentioned uses an exponential discount factor to model how people value pleasure today versus pleasure in the far future. Consider a consumer who is indifferent between enjoying one additional dollar of consumption today and 99.6 additional cents of consumption tomorrow. Such an individual has a daily discount factor of 0.996, and if she is an exponential discounter her annual discount factor will be about 0.23 (corresponding to an annual discount rate of about 146 percent). She would therefore strictly prefer 24 dollars of additional consumption today to 100 dollars of additional consumption one year from now, and would happily accept seven cents today in exchange for 100 dollars in five years. If you ever so slightly prefer consumption today over consumption tomorrow, you'll prefer pennies today over huge amount of money in the far future, according to the model. What should economists do in the face of such a surprising result? It's a tough question. We could call the conclusion absurd and modify the model until it produces an alternative conclusion that sounds more reasonably. Or we could go against our intuition and attempt to test this result empirically. Avinash Dixit, co-author of the outstanding "The Art of Strategy ," recently published a paper exploring the Seinfeld episode in which Elaine must ration her remaining contraceptive sponges. Dixit's model can give Elaine precise advice once she establishes how many sponges she has remaining and how she feels about the trade-offs between "pleasure" today and "pleasure" in the future (the discount rate). If sponges are plentiful and Elaine's discount rate is fairly low, any man will do. But if her discount rate is high, she'll wait for a nearly perfect man no matter how many sponges she has. I've finally had enough math to be able to follow the paper's model. I wondered if it made me a bad person that I labored through understanding this model when I usually just skim over models involving, say, optimal portfolio theory. Hat tip to the Freakonomics blog. There's an old joke among free-market types where one economist sees a $20 on the ground and delightedly bends over to pick it up. The other economist scolds him for the effort, saying, "If there really were a $20 on the ground, someone would have picked it up by now. It must be an illusion." Today, I head to the Metro for the evening commute. There are two turnstiles to enter and one to exit. Yet there is a huge line of people behind one of the enter turnstiles while the other is vacant. I reason: if the other enter turnstile was working, someone would be using it. So I write it off as broken. After I've waited behind 8 or 9 people for the one good turnstile, someone walks by and gets through the "broken" one without incident. I follow behind, through the turnstile that's been there all along. I am reading Hernando de Soto's "The Other Path " for an upcoming class. I highly recommend it. His points are difficult to summarize in a short blog post, but I'll do my best. Writing in 1989, de Soto and his colleagues examined the poor "informals" residing in Peru's capital, Lima. The legal process in Peru at that time made it next to impossible for most residents to do anything through formal means. Acquiring formal housing took nearly two decades. 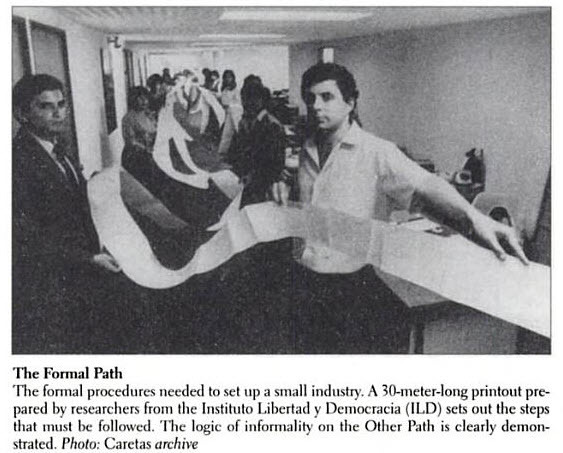 The above photo shows de Soto's staff holding a 30-meter-long list of procedures that were required to start a small business. So, the informals took the law into their own hands, setting up 60% of the city's housing and establishing 95% of its bus routes without the proper government endorsements. De Soto argues that such "illegal" activity did not reflect an outlaw mentality, but rather, economic entrepreneurship. While these informal residences and businesses were surprisingly efficient, they wasted a huge amount of resources defending their property and bribing public officials. These residents had no guaranteed property rights, which severely hampered their willing to invest. After the book's publication, de Soto's organization worked with Peru's government to drastically simplify these legal processes.